Take 1 softgel 1 to 3 times daily withwater 30-60 minutes prior to meals. Caution: Keep out of reach of children. If pregnantor if you have a medical condition, consult with a health careprofessional before use. 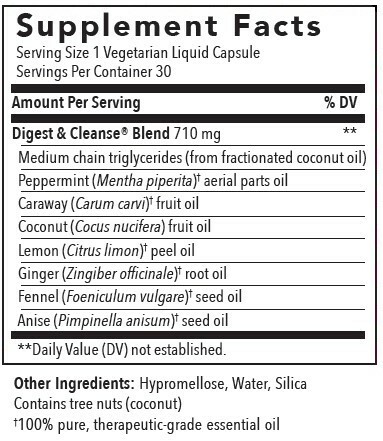 Proprietary Digest + Cleanse; Blend (Peppermint (Menthapiperita)† leaf, Caraway (Carum carvi)† fruit, Lemon(Citrus limon)† peel, Ginger (Zingiber officinale)†root, Fennel (Foeniculum vulgare)† seed, Anise (Pimpinellaanisum)† fruit), Coconut (Cocus nucifera) meat oil [virgin],coconut (Cocus nucifera) meat oil [fractionated], gelatin,glycerin, and aqueous coating solution (oleic acid, sodiumalginate, medium-chain fatty acids, ethylcellulose, and stearicacid).